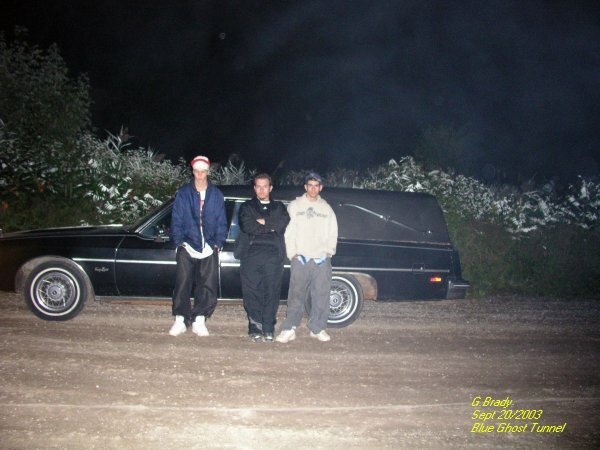 I approached the group and they wanted to go, but they asked to have their picture taken by the hearse to see if anything was around them. Sure enough there was some energy moving in as indicated in the photo. I had a feeling that something was near us all when I took it. The energy in the last picture I had taken was just forming around the three guests. 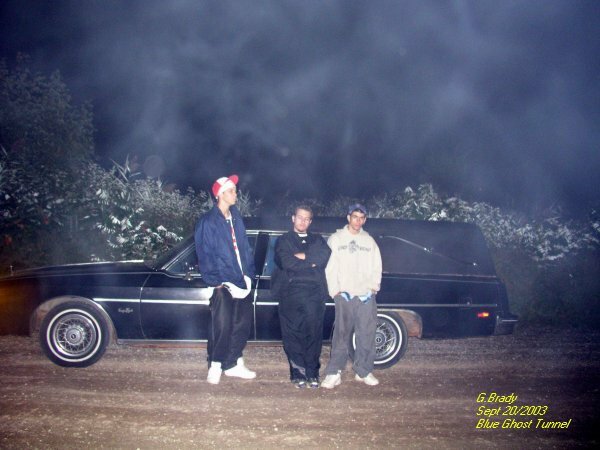 In this photo the energy form showing in ecto plasm formed even more around the car and Paul, Matt and Mike. We could all feel something around us since we went to the tunnel this night. 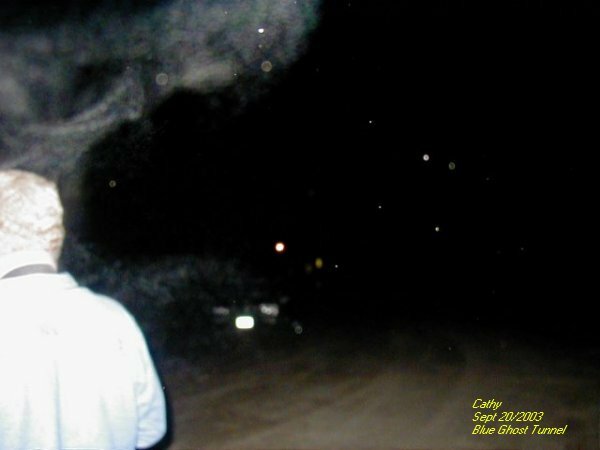 Cathy had taken this picture of me and caught some ecto around me. Everyone had claimed it was September, the spirit that had followed Russ back home. As you can see I was not expecting this picture to be taken and it caught me by surprise so to speak. In the picture you can see that I had a spirit that liked me for some reason. As I headed back for the car Cathy took a picture of me again. As seen in the photo I had a spirit friend hovering just above me with a face that was forming. Was this September, the female spirit that gave Russ a hard time when he last visited this area? For some reason on this night the BGT was full of activity. Not only did they show themselves they had also followed us back to the cars. I believe that the spirits that are at the BGT had a message to tell us. Over time maybe we can piece together what the spirits were trying to show us. The BGT has a lot of activity to it, there is no doubt. The BGT was brought up by Russ and his friends that had done a lot of investigations to this old tunnel. If not for Russ sharing his knowledge and experiences at the BGT we would have never known about the place. 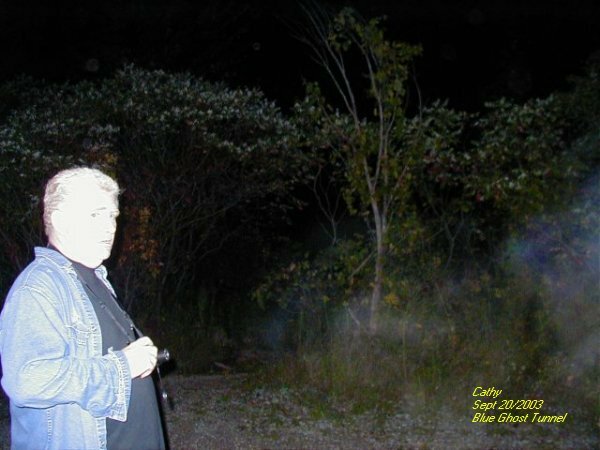 Russ has since taken down his web site when he had encountered a spirit that named herself as September who followed him home and created havoc. Russ told everyone that two blue ghost dogs guard the tunnels entrance. If you ever venture to the tunnel DO NOT make fun of September or the dogs that are said to guard the tunnel, for you may have a guest that will follow you back home. 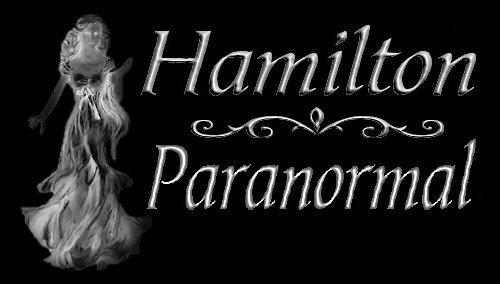 The tunnel in our opinion is better than the Screaming Tunnel which is a well known haunted hot spot within the Niagara Region. We will do future investigations to the BGT overtime. Keep checking back for future updates.